The porra antequerana is a typical dish of Spanish region of Malaga, in particular the city of Antequera, from which it takes the name. This dish is a cold soup from tomatoes peppers, and very similar to gazpacho. 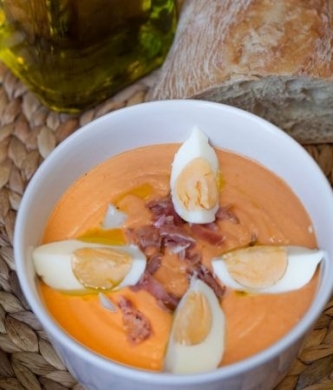 As we have said on other occasions, in Spain there are several versions of gazpacho soup: consider this one of those. The difference lies in accompanying this cold cream from pink to boiled eggs and ham (jamon serrano) cut into pieces, or even to tuna. Creamy soup is obtained and mix the ingredients mentioned in stale bread and oil and vinegar. Put in warm water the stale bread (better if a couple of days) for one minute. Then strizzatelo for well and cut into chunks. Pureed bread with chopped tomatoes, peppers into strips and garlic cloves, along with salt and oil. Frullatelo until obtaining a compound creamy pink. Then do rest cream in the refrigerator for about an hour. Served cold covered with pieces of hard-boiled egg, pieces of ham or even tuna in oil.